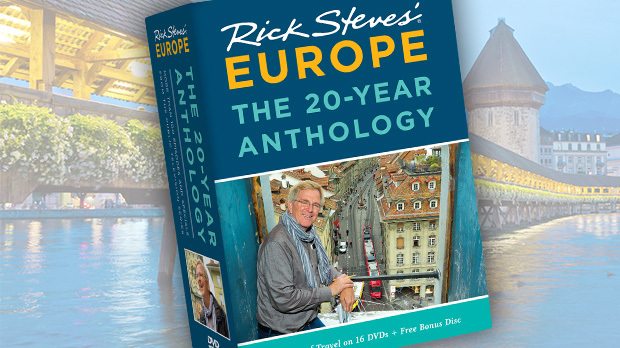 Stretching across roughly 750 miles, Europe's highest mountain range, the Alps, arcs across eight countries, from the Mediterranean coast of France to the eastern fringes in Austria and Slovenia. Along the way, alpine cultures and landscapes offer a fascinating variety of experiences. France may be home to the tallest peak (Mont Blanc), but it's Switzerland's Alps that are the high point for most travelers. With majestic snow-capped summits, waterfall-laced cliffs, and picturesque lakes, they have hiker-friendly amenities — well-marked trails, restful mountain huts, and a system of lifts and trains that let you effortlessly ascend to dramatic mountaintops. As famously great engineers, as well as ardent nature lovers, the Swiss know how to make alpine thrills accessible to almost everyone, regardless of stamina or skills. 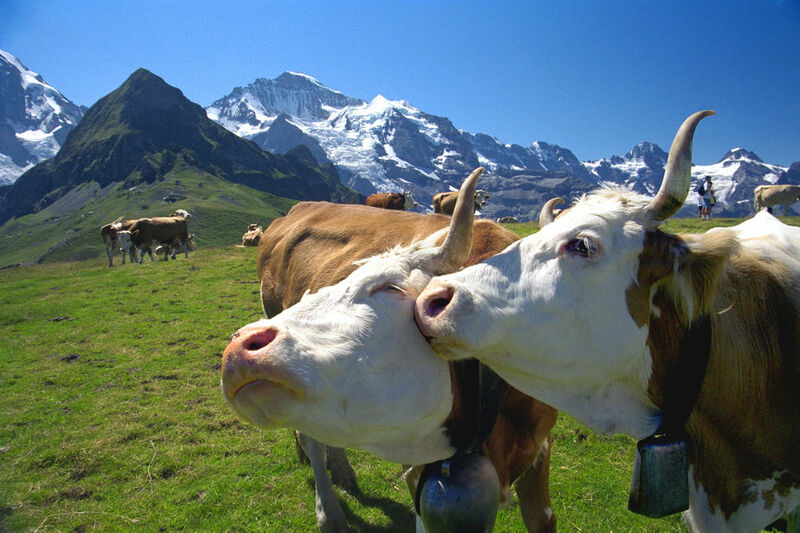 My favorite region in the Swiss Alps is the Berner Oberland, south of Bern and crowned by a trio of formidable peaks: the Eiger, Mönch, and Jungfrau. A good, easy hike is along the ridge between Männlichen and Kleine Scheidegg, which separates the Grindelwald and Lauterbrunnen valleys. To do this hike in a reasonable amount of time and with minimal exertion, I recommend taking the narrow-gauge train from the valley base of Lauterbrunnen up to the town of Wengen, then a gondola to Männlichen. From there, the trail winds gently downhill past staggering mountain views, contented cows, a perfect picnic spot, and a fine restaurant. You'll get a loftier view of those same mountains from the 10,000-foot Schilthorn summit, across the valley from Wengen. The Schilthornbahn cable car takes riders up effortlessly in four stages. At about $100 round-trip, it's a pricey trip, but when you're surrounded by cut-glass peaks and breathing fresh mountain air, it's one of Europe's great deals. Whether filled with skiers in winter or hikers in summer, there's a happy energy as you ascend in that glass-and-steel bubble of mountain joy. The Swiss love to cap their peaks with restaurants, and one of the most popular is the Schilthorn's revolving Piz Gloria. Before opening to the public in 1969, it was the setting of key scenes in the James Bond movie, On Her Majesty's Secret Service. Today, there's a fun 007 exhibit…and even Bond-themed toilets. While gravelly trails lead down from the Schilthorn, casual hikers prefer taking the cable car down to Birg station. The station, while a fine springboard for hikes, is also entertaining, offering the Skyline Walk, a viewing platform with a transparent floor that juts out over the cliff edge, and the Thrill Walk, a fun, 200-yard course with a steel-and-glass-bottom floor, rope bridge, and tunnel. From Birg, you can walk down to the rustic hamlet of Gimmelwald (a great place to enjoy a post-hike beer — or better, spend the night). The French Alps are no less dramatic than Switzerland's — and come at less of a premium to travelers (as Switzerland is Europe's most expensive country). My pick of the region is the range that hovers just above the resort town of Chamonix — near the junction of France, Switzerland, and Italy. 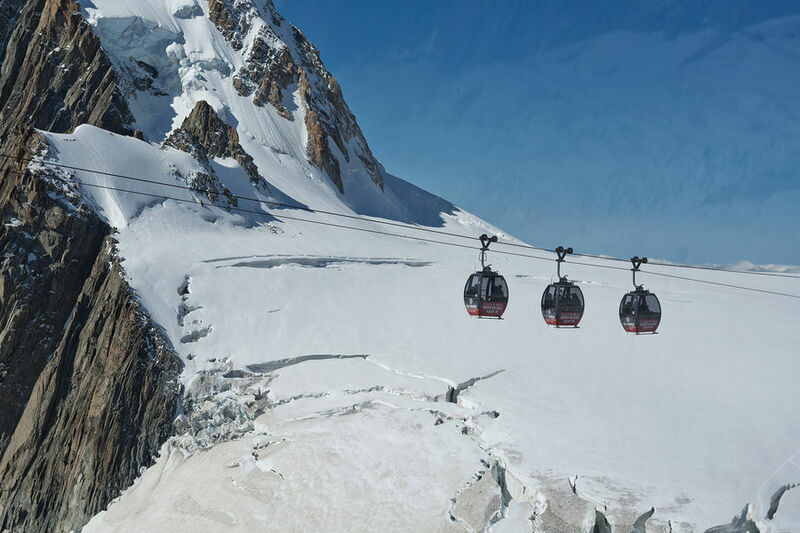 In Chamonix, if the weather's right, there's nothing better than riding the cable car to the Aiguille du Midi, the 12,600-foot rock "needle of midday" high above town and in the shadow of Mont Blanc's summit. Up here, the air is noticeably thinner than back on earth, and even when the sun's out, it's still bitterly cold in July. From here, a cute red gondola — Europe's highest lift — glides slowly along a three-mile cable, dangling silently over the Mer de Glace (Sea of Ice) to Helbronner Point, at the border of Italy. Above Chamonix Valley, the Grand Balcon Sud hike is lovely. Being a hiking lightweight, I prefer a trail where I can ride a lift to one end, enjoy high-mountain kicks all along (with minimal altitude gain), and then ride the lift down from the other end. This three-hour walk comes with unforgettable views of Mont Blanc, glaciers, and wildflowers — and a small fraction of the Aiguille du Midi crowds. Much farther east, near the Austrian border, Italy's Dolomites offer an entirely different alpine flavor. Dolomite — a sedimentary rock similar to limestone — gives these mountains their distinctive shape and color. This region — part of Italy only since World War I — is also unique for its Austrian roots, which still survive here, from the food to the bilingual German-/Italian-speaking locals. The city of Bolzano ("Bozen" in German) — blending Austrian tidiness with an Italian love for life — is the Dolomites' gateway. But I prefer settling in higher up, in Kastelruth ("Castelrotto" to Italian speakers) — right in the midst of mountain splendor, yet without that empty ski-resort-in-the-summer feeling. Both towns provide easy access to the Seiser Alm ("Alpe di Siusi" in Italian), Europe's largest alpine meadow. Undulating rather than flat, broken by rushing streams, and dappled with shapely evergreens, the Seiser Alm is a well-run national park. It boasts shuttle buses, well-kept huts, trails, and lifts, along with spectacular views of the surrounding Dolomite peaks and lots of cows — who produce two million gallons of milk annually. Whatever level of physical exertion you prefer, there's a hike (or lawn chair) here perfectly suited for your Alp-viewing pleasure. 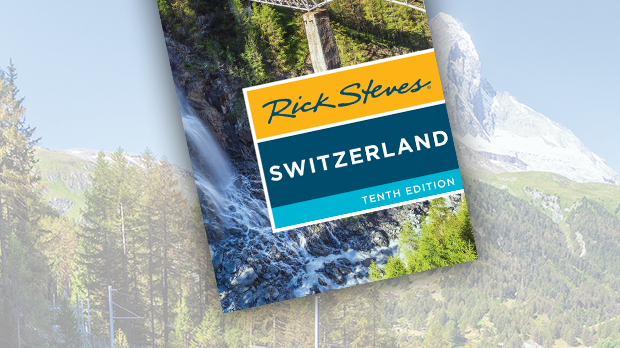 No matter which corner you're exploring — Switzerland, France, Italy, or beyond — the Alps provide a symphony of experiences that can endlessly delight lovers of culture, history, and nature. They certainly have for me.